We are easy to reach using public transport. Both the 151 and 213 buses stop very close to the church. You need to get off at the “Lindsay Road” bus stop. 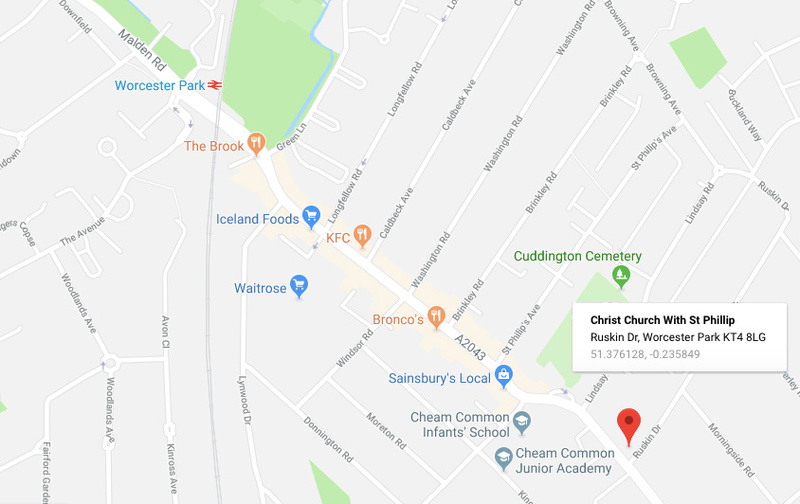 If you arrive on a bus traveling towards Worcester Park station or Kingston, you simply need to cross the road at the pedestrian crossing and you will have arrived at our church. If your bus is going towards Sutton or Wallington then continue to walk in the direction the bus is traveling for 1-2 minutes and the church will be on your left-hand side. Buses are frequent – you can see exact times on the 151 bus timetable and 213 bus timetable. If you are traveling by train, the nearest station is Worcester Park. 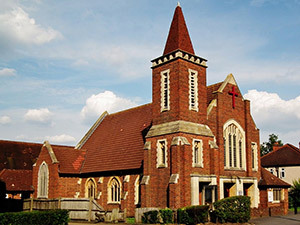 From the station, it takes about 15 minutes to walk to the church; simply turn left out of the station and walk straight up Worcester Park’s high street, Central Road. Ruskin Drive will be on the left-hand side. Both the 151 and 213 buses travel this route if you would prefer a shorter walk – you can catch these buses directly outside the station. You can plan your journey to us using the TfL Journey Planner at the top right of this page. We have a small car park which can be accessed from Ruskin Drive. There is also on street parking available on Ruskin Drive and adjacent roads. Hirers and their guests are asked to park in the Church car park considerately and encourage participants / guests to walk or use public transport where at all possible.